Meandering on from the discussion on forms of responses from a couple of months ago: my tolerance for snark has gone down markedly over the last few years. And it’s not just snark: it’s responses that, in whatever fashion, have as their substance “you are wrong, I am right, and I am going to focus on this”. Which is a frequent symptom of comments that I dislike: the commenter who is motivated to speak because of his or her strong feeling that the article being commented upon is misguided. But my dislike bothers me, too! 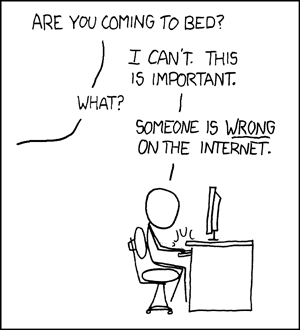 Not least because I feel that pull strongly myself at times: I’m getting better at telling when I’m feeling the pull of “someone is WRONG on the internet”, but even so much of the time I don’t manage to resist it, or other similarly negative urges. (And I’m rarely happy about the result the next day.) That’s not the whole reason, though: part of my disquiet is that I don’t understand all of the components of my dislike, that I’m fairly sure that there are positive aspects playing into that dislike, and that I wish I knew better how to tease out those positive aspects. For example, let’s set aside the negative aspect of snark and negative comments, and focus on their self-centered aspects. Replace a negative comment with a positive one that’s similarly self-centered; how would I feel about that? My first reaction is that I am, in fact, okay with this. Part of that feeling comes from the idea that the web is a customer service medium, motivated by a question of “why wasn’t I consulted?”. This is a motivation that can lead to excess, but in general it points in a direction of more participation rather then less participation, which I feel is to the good. And part of my happiness with such an approach comes from the self-centered nature of my blogging: this blog is purely about whatever happens to be interesting my brain at any particular moment, what I want to get out of something that I’ve encountered, and I’m pretty happy with that. It means that much of what’s here isn’t particularly likely to be of interest to almost anybody else; that’s fine, and I’m also perfectly happy for other people to write similarly self-centered blogs. In fact, I often find such blogs surprisingly interesting: I’ll find myself reading about a post on something that I would normally not think twice about, and being drawn in by the author’s focus and interest on that topic. And then there’s the ego-boost factor to positive responses. I don’t think that adds much to my feelings, though: a vapid positive post or one that’s all about the respondent’s feelings isn’t much of an ego boost, while one that ties in to something else the respondent cares about can be interesting enough to sidestep the question of ego boost entirely. That’s the self-centered aspect of snark; what about the negative aspect? Would I be as unhappy with posts that are negative but not self-centered? Probably not. Take, for example, “Considered Harmful” Essays Considered Harmful, arguing against a particular kind of negative essay. I agree with much of that article; having said that, I’ve also learned a lot from some “considered harmful” essays, and in fact referred back to Recursive Make Considered Harmful just a couple of months ago. If you don’t see the use of it, I certainly won’t let you clear it away. Go away and think. Then, when you can come back and tell me that you do see the use of it, I may allow you to destroy it. So yeah, it really is the combination of self-centeredness (or rather, other-denying) and negativity that bothers me. How should I deal with that when I see it? Gerald Weinberg recommends an “aikido way to engage blaming”: yield, accepting the other party’s anger, without accepting their blame. Then, once you’ve aligned with their anger, redirect it somewhere more productive. “Dealing with Internet Trolls – the Cognitive Therapy Approach” gives some recommendations that aren’t too dissimilar to that approach. In general, if negativity is coming at me from elsewhere, then responding in a not-directly-opposed manner makes sense to me. What if it’s coming from me, though? A few years ago, Kent Beck was talking a lot about appreciative inquiry. The idea there is: focus on strengthening the good aspects of a situation, on growing the seeds of good events in your past, and the good will outweigh the bad. Which makes a lot of sense: don’t let bad experiences drive your life. A pure appreciative approach wouldn’t work for me, though. As GTD teaches us, if something’s in your head, it needs to be acknowledged: in particular, ignoring something bad can cause it to fester and grow. So yeah, stating “this bothers me” is necessary. That’s the first part of the aikido approach: acknowledge the anger, let its energy flow if it needs to. But acknowledging that anger doesn’t mean giving in and letting it control you: if you can interact with that anger with compassion (towards others, towards yourself!) and redirect it, maybe something good will come out of it. 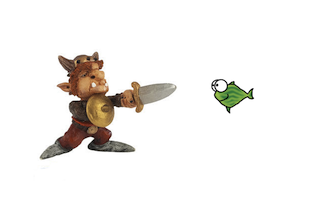 Image sources are linked to on the images themselves, except for the troll/fish picture, which is a combination of this troll image and Shlomi Fish’s logo. This post isn’t a sign that I’m feeling particularly bad about anything right now—I’m really quite happy with my life these days! 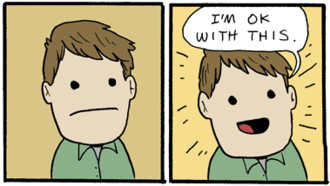 It’s mostly an excuse to do a linkdump of some related articles that I’d come across recently. 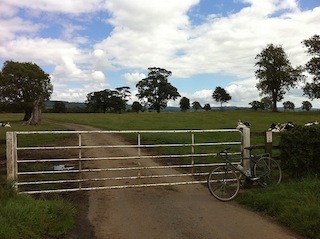 One link I didn’t manage to fit in: Long Overdue, from Dubious Quality. Bill Harris says that his writing was much stronger when he was funnier and angrier; I wasn’t reading him back then, and I’m sure that writing had its virtues, but I really like what his writing has turned into.